Where's this meant to be? I'll let you guess. There are quite enough places called "Newport" dotted around, after all. There is only one city, though. Aha, so it's Newport, South Wales then? Enough about politics! Now what about the road? Well, I need to take you on a little history lesson first. The idea for a bypass of Newport goes back to the early part of the twentieth century, although the first official plans were made in 1946. Perhaps not surprisingly, due to the fact that the country was what might be termed "slightly poor" following the end of the Second World War, the actual construction of the fully designed road running to the north of the city was put off. So, by the time work restarted in 1961, there was in existence a fully planned out road. However, there was a fairly major problem. Instead of a standard dual carriageway, the Newport Bypass was to be constructed as a full motorway, although it was to be two lanes (plus hard shoulder) in each direction. So, there was a fairly major redesign job needed, although the actual route was identical. The largest change was in the Crindau Ridge area, where instead of the original requirement for a single tunnel, twin tunnels (known variously as the Crindau Tunnels or the Brynglas Tunnels) were constructed. These tunnels are the highlight of this section of the M4 (as far as I'm concerned, anyway! ), but they became a major bottleneck on the route as time went by. So, what to do? 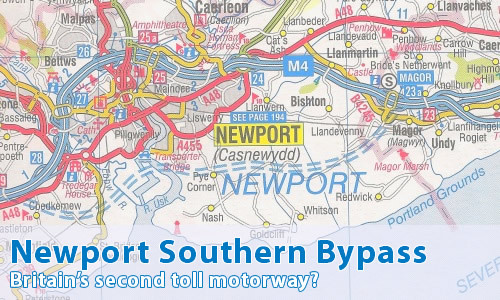 The simple answer - another bypass of Newport, this time to the south of the city. One small city, two bypasses? Add to that the fact that there would be a new bridge over the River Usk immediately to the east of the tunnels, and you're adding up to a seriously expensive job. So, south of the city is pretty much the only alternative if you're going to build something. So, in 1991, that's precisely what the Welsh Office announced that they were going to do, with a planned construction date of 2000. In 1993, the full plans were announced for a £300 million construction project. However, there was to be a sting in the tail for motorists. The plan was for the motorway to be constructed privately, and a toll to be levied on its use, similar to that on the then-A446(M) bypassing Birmingham and Wolverhampton. Several years of general faffing around followed, with the scheme surviving the major culls of the road construction budgets in 1994 and 1997 - a move that saw the motorway start to appear in commercial road atlases as a proposed motorway. This state of affairs didn't last long, with the route finally being binned in 2002. However, rumours soon started to appear about its resurrection, with the local press claiming from 2004 onwards that the road would be back on. For once, they were right. In 2006, the Welsh Assembly Government announced that the road was back on, with a slightly adjusted route and a planned opening date of 2013. Confusion reigned as to whether the motorway would be tolled or not, as it seemed that every succeeding press release told a different story than the one before, with various unofficial names such as "M4 Toll" and "New M4" being bandied around. Still, the fun didn't last for long. As the cost of the motorway ballooned to the £1000 million mark, the route was cancelled once more in July 2009 to be replaced by measures such as variable speed limits on the old M4. The road refuses to die off, as there are still regular calls for the cancellation decision to be reversed once more, although the Welsh Assembly Government are adamant that they cannot afford to build it.